Not only a floral arrangement but an art piece. 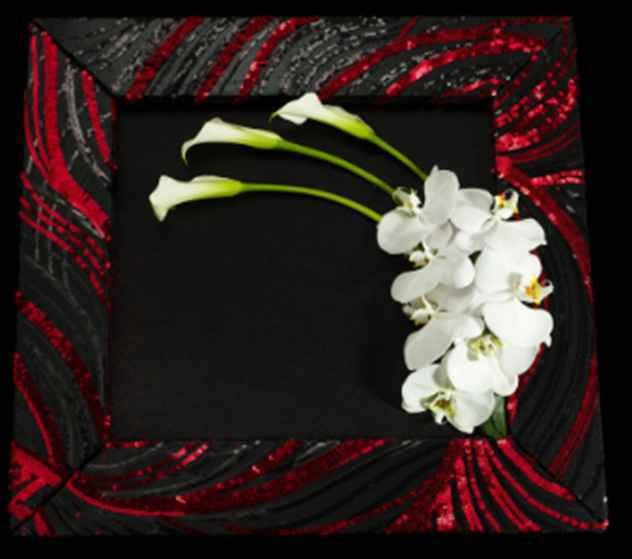 White cymbidium orchids and white calla lilies are set in a custom designed frame. When we say that our flower shop creates designs that are like artwork, we mean it. This delicate arrangement has a base of bright white cymbidium orchids that flow into a stunning expression of white calla lilies. All the beauty is enclosed in a custom-pained frame. Your guests will likely think about how realistic this “painting” looks. But upon making a closer inspection, they’ll see it is really a group of floral beauties on display. What fun! This arrangement also compliments floral centrepieces on a nearby table that can match the color palette of white and deep red, perhaps with a bit of pink mixed in for contrast. Use this arrangement to give your next event a contemporary art museum feel that is classy and special. One party planner said, “This is the best flower shop near me NYC has to offer with the best flower delivery NYC event planners count on to buy flowers people will love.” Our designers take great care in creating floral art pieces for our esteemed clients. That’s why we get so many repeat orders from our clients and they tell all their friends about us. We look forward to working with you to help plan your next event. If you want your wedding flowers to be unique and buy flower varieties that are rare and beautiful, then you found the best floral designer NYC has to offer. We have an excellent track record as the best flower delivery service in NYC. In addition, we’ll arrive on time to make your wedding and the reception spectacular. Order our orchids in NYC now to make your next event memorable!